I finally got to experience Singapore Air's new business class. The new seats are like the ones in first-class cabins of most other airlines at this time. Much wider than before (they have replaced the 2-2-2 configuration with a 1-2-1 configuration, which means there are two less seats per row, and every seat is an aisle seat), large TV screen, and lots of storage space for glasses, books, shoes, etc. The seat converts into a fully flat bed, with bedsheets, duvet and large pillows! They also have new and better noise-cancelling headphones. Watched Casino Royale all over again; I think this one is one of the best James Bond movies ever. Also watched Flushed Away (children will enjoy the movie), Deja Vu (timepass), Dreamgirls (very good), and A Night at the Museum (timepass). The stopover in Incheon Airport, Seoul was extended by an hour due to some technical problems in the aircraft that had to be fixed. That gave me a chance to spend time at the excellend SilverKris lounge. The service by the Singapore Air staff continues to be excellent. They had hand-outs explaining the delay within mintues of our landing in Seoul. I also noticed they won the Conde Nast Traveller's Best Airline award for the 8th consecutive time this year. 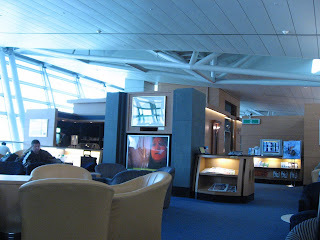 The pictures here are from Seoul airport. 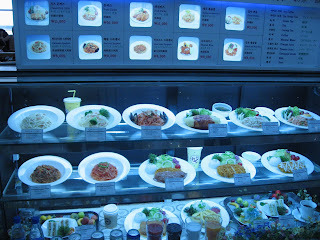 The first one is of food displayed at an airport restaurant, the second in the Silver Kris lounge.